At the start of my MBA, I very quickly found a society which was right for me: the Cambridge University Energy Network (CUEN), and it turned out to be a fantastic opportunity to get in touch with students from other disciplines also interested in energy. On 9 June, we organised the annual CUEN conference with the title “Renewable Energy – The Holy Grail of Future Energy?” We had lined up seven exciting speakers, each covering the challenges lying ahead of the energy industry transitioning from fossil fuels to a CO2-free generation. The first speaker was Anne Richter, Associate Vice-President of the Swiss renewable energy investment firm SUSI Partners. Anne explained how they are looking for low risk and long term renewable investments. The company currently focuses on investments in onshore wind and solar PV as well as energy storage projects. 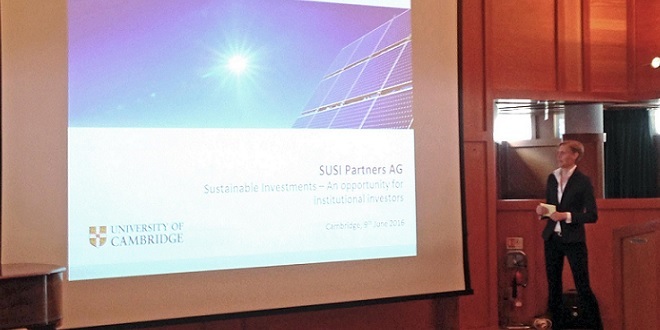 Geographically SUSI Partners have so far only invested within Europe, but Anne emphasised that the company was willing to broaden their investment horizon and to also look into offshore wind investments, as well as renewable energy projects, in Africa. Africa was also a focus topic of the next speaker, Daniel Gallaher, Chief Legal Officer at Cambridge Energy Partners (CEP), a Cambridge-based energy start-up. CEP provide solar power solutions to off-grid industrial operations in sunny regions that require large amounts of power, such as mining or agriculture. This method can help mines, usually relying on diesel-generators for electricity production, to cut energy costs significantly. In the third talk, Dr. Johannes Boeske, Head of Onshore Wind Controlling at RWE, discussed the assessment of renewable generation types along the dimensions of physical abundance, technical feasibility, economic viability and public acceptability. In the case of onshore wind Johannes saw no limitations in global wind resources. Technical innovations over the past years were also very positive and had resulted in a new generation of large onshore turbines (7.5MW) which operate very efficiently and, because of this, are economically competitive. Yet the installation of such large turbines is becoming increasingly controversial with the public. Public acceptability might therefore be the greatest obstacle for further onshore wind growth. After a quick lunch break, it was my turn to give a presentation. Given my background in the offshore wind industry I decided to talk about the progress, problems and perspectives of offshore wind. With onshore wind facing challenges around pubic acceptability, offshore wind allows for an interesting alternative. However, in order to become an economically viable alternative, offshore wind costs need to come down significantly over the next few years. I focused on how offshore wind is likely to achieve considerable cost reductions thanks to developments in the fields of market design, wind turbines, foundations as well as operation and maintenance. 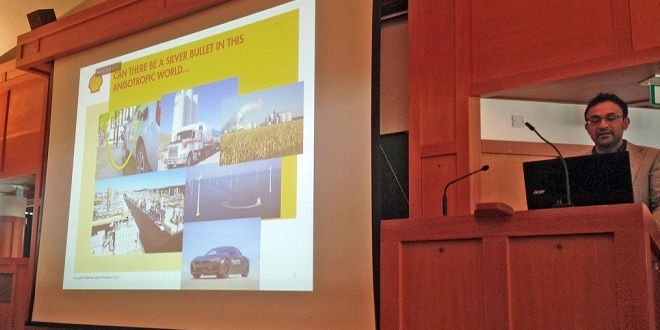 Arnab Chatterjee, Business Manager Hydrogen and Fuel Cells at Shell, gave an outlook into different energy markets which are likely to be fundamentally transformed over the next few years. This is particularly as electric cars may soon become the norm if more countries follow the example of Norway, which recently announced plans to have 100% of their cars electric by 2025. After another short coffee break, Adrian Ross and Cameron Rae from Ofgem E-Serve gave an overview of the different renewable energy support mechanisms the UK government has introduced over the last few years. 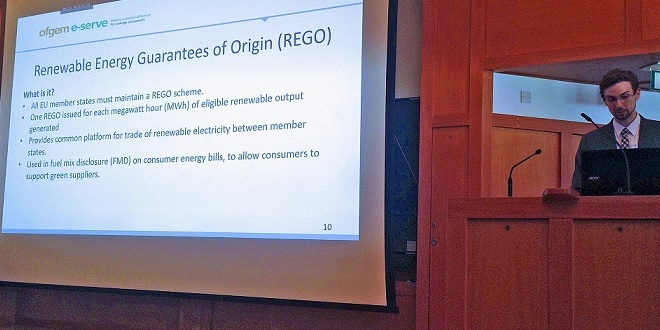 From Feed-in-Tariffs for smaller scale generation over Renewable Obligation Certificates (ROCs) to Contacts for Difference (CfD), Adrian and Cameron explained why they have been introduced and what these support mechanisms meant for UK electricity retails consumers. The last speaker was Dr. David Reiner from the CJBS. David introduced the topic of synthetic biofuels and how it could help to de-carbonise the transport sector. He suggested that while light-weight vehicles can be powered electrically, heavy weight vehicles as well as planes and ships might be much more likely to run on biofuels. Even though no speaker claimed to have found the “holy grail” of future energy, various speakers emphasised that large-scale energy storage was something future energy systems definitely needed. This might be an interesting topic for next year’s annual CUEN conference!